Who wouldn’t love to save money on their grocery bill? 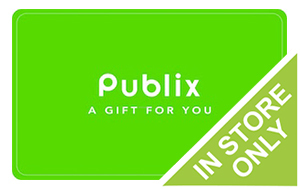 Purchase a discounted Publix gift card, and that’s exactly what you will do. With departments in grocery, bakery, deli, meat & seafood, produce, floral, beer & wine, baby, and more, you can find everything you need while spending less money! If you have a remaining balance on your gift card after your visit- you can use it next time. It’s just that easy. What started as one store in 1930, there are, as of 2016, more than 1,100 locations across the southern states of America. For many southerners, this is the go-to grocery store, and has been for many years! Now think of how much money you can save with a discounted Publix gift card. What’s more, because gift cards are a type of currency, all other store coupons and promotions remain valid! Check out their weekly ads and go online for digital coupons for even more savings! Like BOGOs? They have them. You can also join their paws, wine or baby club and receive additional discounts on the products you love! We understand how difficult it can be to live on a budget, and we work to save you money in as many areas possible. A Publix gift card will save you money on your entire purchase. Don’t forget, they also have a pharmacy, and that administers flu shots, vaccinations, and health screenings, for a healthier you! When you purchase a Publix gift card from Cards2Cash, you can buy more groceries for less money! But the savings don’t end there- Cards2Cash offers lots of discounted gift cards for many other grocery stores, restaurants, gas stations and more! To save even more money every day, be sure you check out our listings for Winn Dixie, Piggly Wiggly, Albertsons, Food Lion, and more! With Cards2Cash on your side, saving money on your groceries is easy! Do you have a Publix gift card you aren’t planning on using? Cards2Cash will buy your card from you! Not only that, but we pay top dollar buys gift cards for many retail locations. If you have a gift card, you would like to sell, stop in one of our retail locations for immediate payment for your card OR fill out our online form, and we’ll get back to you quickly with an offer. Remember, Cards2Cash is your best deal for saving money!